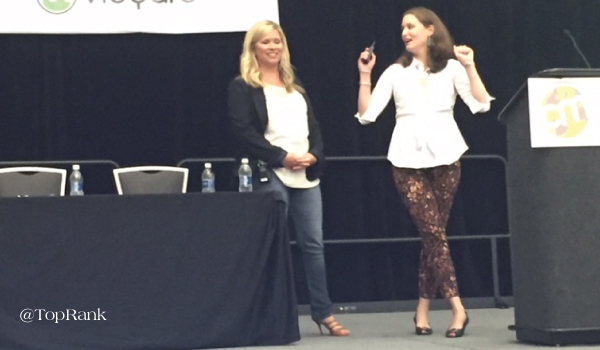 Shelley Ryan and Lauren Mauro of Dell kicked off their afternoon session at Content Marketing World with some exciting news. According to the dynamic duo, Dell has purchased EMC, which I believe makes them the largest privately held company in the world! At the beginning of their session, Lauren and Shelley shared what their session would NOT be. They vowed not to talk about the case for influencer marketing, the risk of not having a strategy or a college course for why you should do influencer marketing. What they did focus on was their point of view, real examples and their own journey with influencer marketing. Dell realized that in the absence of an influencer marketing strategy, there was rogue activity happening. When they did create a strategy, it helped bridge the gap. Below are three key elements of Dell’s successful approach to influencer marketing. What the team at Dell realized was that they had a group of really important influencer voices, but there was no coherent strategy. What they needed was a model that their entire team could get their head around and follow. 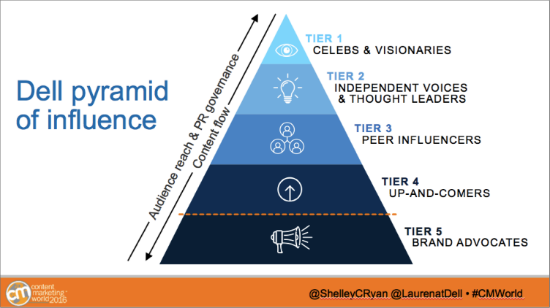 That is why they crated the Dell Pyramid of Influence which encompasses the full-eco-system of their influencer relationships. Tier 1: Celebs & Visionaries – These relationships are few and far between, but have the broadest reach. This group of influencers are those that get the premiere, white glove treatment from the team at Dell. Tier 2: Independent Voices & Thought Leaders – This group would include the traditional PR relationships with bloggers and social influencers. Tier 3: Peer Influencers – Interestingly, these influencers don’t necessarily have to have a social presence or create content on a regular basis. It doesn’t matter because it’s been established that they are influential to the audience. Tier 4: Up-And-Comers – This is a great place for brands to really have an impact. Identifying smart individuals and helping people build their own influence can offer a lot of value in the long run. Tier 5: Brand Advocates – These influencers are people that are already fans of the brand and can act as advocates for the organization. Core to Dell’s approach to influencer marketing is that the relationships must be authentic and that there is shared value for the influencer, the brand and the customer. Below are a couple examples of the influencers that Dell has worked with that meet all of these objectives. As a philanthropist and environmentalist, Adrian cares about having a positive impact. In uncovering this information, Dell realized that while their commitment to sustainability is a huge part of their business, it wasn’t being communicated as well as it could have been. The team at Dell understands that sustainability is of growing interest to their customers – especially Millenials – and that they want to buy from and work for companies they believe are responsible. So, Dell brought on Adrian as a social good advocate to work with their sustainability team. He weighs in on sustainability strategy, such as using eco-friendly packaging and materials and his involvement at events and in content helps to amplify the great work that Dell is already doing. Mike was named the National geographic Adventurer of the Year, is an extreme climber and one of Dell’s Rugged Influencers. Mike takes his Dell technology out on his expeditions and shows the durability of the system in really harsh conditions. One of the objectives for this approach was to reach more c-level decision makers that are buying more rugged tech. According to Lauren, Rakia is a true Dell brand advocate. She’s an example of someone that is really utilizing the product to grow her business. The team has enjoyed working with her and has really grown the influencer relationship alongside Rakia’s business. Align Your KPIs: A successful influencer marketing program will closely align with business goals and objectives. Document It: It’s important to document your influencer marketing point of view. That way, you have a point of reference if there is ever a question. Additionally, you’ll want to make sure that you cover all of your bases legally with influencers. Training & Governance: Training is an essential part of successful influencer marketing. By creating a toolkit or playbook for your team, you’re able to create consistency and scale. Go Niche: Instead of trying to tackle all tiers of influencers at once, consider tapping into the expertise of people that are already championing on your behalf. Be Authentic: Above all else, an authentic approach to influencer marketing will provide the most value for the brand, the influencers and ultimately the audience. Disclosure: Dell is a TopRank Marketing client.